The Good Women of China is a collection of true stories about the lives of Chinese women in the late 1980s and early 1990s. Xinran is a Chinese journalist who hosted a radio program called “Words on the Night Breeze”. This program was directed at women, and bit by bit Xinran was able to invite her listeners to share their stories. Even though she had to work around the tight constraints of government censorship, Xinran managed to cover topics that had long been banned from the public discourse: female sexuality, contraception, sexual abuse, homosexuality, arranged marriages, and even the question of whether or not women were happy with their lives. The Good Women of China doesn’t necessarily find answers for the many questions it raises, but the fact that it raises them at all in a society in which silence reigned makes it a remarkable book. One of the things I appreciated the most about it was the fact that it was written by an insider, an actual Chinese woman. Not only because this guarantees that she truly knows the cultural context about which she’s writing, but also because it leaves little room for condescension, cultural generalisations, or the idealisation of the state of gender equality in the West. This is a tricky issue, and a problem that western writers dealing with the East or Middle East often have to face. Obviously I realise that I have many more opportunities than, say, women in Afghanistan, but I find that most of the time comparisons between different countries are not very useful, and can even be distracting. Xinran doesn’t invite the western reading public (I say “western reading public” because she had to move to the UK to be able to write this book, due to censorship issues) to pity the women of China and pat themselves in the back about their wonderful, wonderful lives; she merely tells these women’s stories and invites readers to consider several difficult and uncomfortable questions. Another thing I liked was the fact that The Good Women of China was not at all sensationalist in tone. Nor did it feel exploitative, though it sometimes deals with horrifying brutality and heartbreaking tragedy. The tone was always kind, compassionate and honest. Xinran comes across as an extremely emphatic person, and also as someone who’s truly searching for answers; someone who really wants to know what women’s lives in her country are like. Her questions always felt honest, and her interest in the women to whom she gives voice genuine. Just what are women, exactly? Should men by classed in the same species as women? Why are they so different? Books and films may say it is better to be a woman, but I cannot believe it. I have never felt it to be true, and I never will. These are also stories about arranged marriages, about the personal consequences of the Cultural Revolution in countless women's lives, about lost love, about motherhood, about the Tangsham earthquake of 1976, about disabled women, and, as I mentioned above, about lesbian women. Sadly, I have to say that the chapter entitled “The Women Who Loved Other Women” made me sad, as Xinran treads dangerously close to homophobic territory. She does try to be compassionate and non-judgemental, but the way she framed this woman’s story gave me the impression that she couldn’t help but think of her sexual orientation as pathological. She retells this woman’s life story, a story of abuse at the hands of men, as if this explained away the fact that she’s a lesbian. It’s possible that that’s not what at all what Xinran intended, but that’s how the chapter comes across regardless. I do realise that one woman’s story is not supposed to stand for every woman, but still, the fact that she searched for a pathological explanation for her sexual orientation at all saddened me. Another problem I sometimes had with The Good Women of China was the fact that Xinran never wandered too far from essentialist notions of gender. As daring as she is, and as much as she's willing to ask previously unasked questions, they’re all still based on the assumption that men and women are very different; different for reasons other than socialisation and the fact that they have different opportunities. I know this is a prevalent assumption all over the world, and probably I shouldn’t be too hard on her for buying into it, but nevertheless it’s something that always disappoints me. 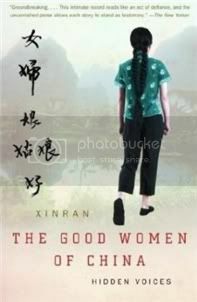 Still, The Good Women of China is a remarkably brave and honest book, and one that I think everyone interested in gender studies and in the state of women’s rights around the world should read. From the matriarchal societies in the far distant past, the position of Chinese women has always been at the lowest level. They were classed as objects, as a part of property, shared out along with food, tools and weapons. Later on, they were permitted to enter the men’s world, but they could only exist at their feet – entirely reliant on the goodness or wickedness of a man. If you study Chinese architecture, you can see that many long years passed before a small minority of women could move from the side chambers of the family courtyard (where tools were kept and the servants slept) to chambers beside the main rooms (where the master of the house and his sons lived). I liked Xinran's Sky Burial okay, but the passage about homosexualty makes me a bit conflicted about wanting to pick this up. Amanda, I'm sure it will make you sad, same as it did me, but I wouldn't shy away from the book for that reason. She doesn't sound hateful at all, and she WANTS to be open-minded and understanding. It's just that she probably never had contact with a GLBTQ person before, and was struggling with what she was brought up to believe. A different but related example: she says in the introduction that at 22 she truly, honestly feared that a kiss could make her pregnant. I'm willing to bet that today she no longer thinks homosexuality is caused by abuse. I was thinking this sounded incredible -- until the comments about the girl's sexual abuse at her father's hand. I'm a bit afraid it will be too much for me. But I'm adding it to the list. It sounds important! Some of these stories sounds so sad. Especially the young girl who was raped by her father. I really struggle with books like this. I don't know if this one would be for me, but I do hope to read Sky Burial soon. I read this quite a while ago, but it was the kind of book I consumed. I don't remember many of the specific stories, except I do remember the story about the girl in the earthquake who died a slow horrible death b/c of the way she was pinned in the rubble. Oh the things our memories leave us with! It sounds like this could be really depressing, but also important. How wonderful that it got written and published! I think this is a book that will make me uncomfortable, but I plan to read it anyway. I have this book out from the library at the moment. I'd like to check out The Good Women of China, it sound heartbreaking (well, the part you mention about the girl who is raped by her father). Interesting that you mention western condescension, where westerners think/believe their rights are better, as I've been guilty of that, I mean, I'm grateful that as a woman I can pretty much do whatever I want. But then, of course, there's a lot left out, i.e. if I wasn't white, or if I wasn't hetero, or if I was rich, then yes, different factors influence what a woman can or cannot do and there are definitely constrictions in the western world too. Anyways, I'm putting this on my TBR. I remember having read this book during my pre-blogging days, but I don't recall any specific stories in there. Like Miss Chopsticks, I think Xinran has a way of writing that tells you what she wants to tell you, but both times, she didn't quite grab me. But I've heard good things about ,Sky Burial, so maybe I'll try that one too. I read this a few years before I started blogging and was so saddened to read about some of the circumstances of these women's lives. I do think that Xinran captured a lot of emotion and suffering in her stories, but her writing style felt a little removed at times. It was almost as if she tried to excise some of her stronger reactions to the stories she heard. All in all a pretty impressive work though, and one that has stayed with me for a long time. I've only read one book by this author so far; that book is Sky Burial and I liked it, though the story is so sad. I need to check out her other books. This sounds like such an important book. I always think it sounds a smidge pretentious to say a book is "important", but in this case it really sounds like it is. I avoid reading about violence against women in fiction, but when it's nonfiction, I really do think it's important to read about what's going on in the world. I haven't read this, but you make a really good point about the writer being an "insider" making it a better book. I have another book by Xinran, China Witness' which is more or less on the same lines. You've made me want to read it. I understand what you didn't like in the book but I also understand where she is coming from. I can only echo what others have said. This does sound like it is a worthwhile book to read, necessary in some respects. I imagine this wasn't an easy book to read even so. Thank you for your thoughtful review. This sounds like such a sad yet, as you wrote, remarkable book. My mother and her sisters have some very bitter memories of their early family life. Growing up in North America as I did, sometimes I forget that it's not just a part of my cultural history, it's a way of life that still exists today. Thanks for a great review. "most of the time comparisons between different countries are not very useful, and can even be distracting." YES, thank you! I am getting so annoyed by phrases that are some version of, "We in the West have so many more opportunities available to us," as though those opportunities are always equal and weighted the same by every woman. Thank you for pointing that out, and so glad this book approaches that in a realistic manner. This is such an insightful review. I will definitely be reading the book at some point, so thanks! I have been trying to figure out if this is the same radio host described by Peter Hessler in Oracle Bones. It certainly sounds like it. It's possible she's writing under a pseudonym, or used one when she did her show, or he gave her one in the book. I can't say what I was thinking about his impression of her show and meeting her in China, because I'm not sure it was the same person! Anyway, I think you would like Oracle Bones alongside this book. It shows someone coming at some of the same Chinese cultural and social issues (though not confined to women) from the perspective of a deep-thinking, sensitive outsider living in China. Here's another one that sounds good and a way to gain some insight into another part of the world and what it is like to be a woman there. Vivienne: It WAS terribly sad, but I'm so glad I read it. Jill: I'm definitely glad it did! Meghan: It'll make everyone uncomfortable, I think, but that's part of why it matters. Kelly: lol, I love how we keep picking up the same books by accident! April: I think we've all been guilty of that - it's only human. But it's good to take a moment to think whether or not those comparisons are useful, I think! Michelle: I know what you mean about her style, but I think it was mostly her trying to be journalistic. I'd definitely like to try her fiction sometime. Zibilee: As I was just telling Michelle, I think the detachment just came from her trying to report things without too much interference from her own emotions. I imagine that's hard! Melody: Sky Burial does sound sad, but also wonderful. Jenny: I know what you mean about it sounding pretentious sometimes, but it does apply to some books! J.T. Oldfield: I'm sure people can and have written insightfully about countries not their own, but it's always good to listen to a local voice too. Violet: I've noticed that she has a few other non-fiction books out - I'd definitely like to read them sometime. I look forward to your thoughts on China's Witness'! Literary Feline: It wasn't - and I imagine it was difficult for her to write, too. Belle: It CAN be easy to forget those things are not in the past. But it's important to remember. Jason: Eek, I definitely didn't mean to imply I'd be the sole westerner not to make those mistakes, though looking back I see how I sounded arrogant. Sorry! I'm sure I'd make them too, and may very well have in this review. About the lesbian woman's story, in her case it may very well be that her abuse gave her the courage to come out, or even made her consider sexual/romantic options she wouldn't have considered otherwise. But the way the story was framed sort of made it sound like it always took something "going wrong" for someone to be gay, you know? That's what bothered me. I agree that it probably takes a lot for people to come out in repressive societies, but who knows what happens behind closed doors? Aarti: That annoys me too. I've probably said similar things in the past, but it's important to remember not to. Ali: You're most welcome! I hope you find it as interesting and rewarding as I did. Trapunto, thank you so much for the recommendation! I'll definitely keep an eye out for Oracle Bones. Kathleen: Yes - it's not uplifting insight, but it's important nonetheless. This does sound like a remarkable book, Ana. Being a Chinese, I'd love to read materials that is of my heritage. Thanks for your review of this book! Many times people have changed the sexual orientation they held for most of their lives due to abuse (it's surely not the only cause, and likely not the main one either, but it does happen). How isn't forcible sexual orientation change supposed to be bad?